Scene at the signing of the U. S. Constitution in 1787. George Washington, who presided over the convention, is the figure standing on the dais. The central figures of the portrait are Alexander Hamilton, Benjamin Franklin and James Madison. Constitution Day is such a big deal at Sam Houston State University that it takes two days instead of one to properly observe it. The day itself is being celebrated at colleges and universities throughout the United States on Sept. 17, the day the U. S. Constitutional Convention ratified the Constitution in 1787. At Sam Houston State, the observance begins Monday with a speech by Michael Olivas, holder of the William B. Bates Distinguished Chair in Law and director of the Institute for Higher Education Law and Governance at the University of Houston Law Center. Olivas's presentation is scheduled for 4 p.m. in Academic Building 4's Olson Auditorium. Based on his recently published book, the title of his presentation is "'Colored Men' and 'Hombres Aqui': Hernandez v. Texas and the Emergence of Mexican American Lawyering." Olivas points out that this Texas case was decided by the U. S. Supreme Court in the same term as Brown v. Board of Education and rivals Brown in its significance. After his presentation there will be a book signing and reception at the SAM Center in AB4. The observance continues on Tuesday (Sept. 18) with presentations by four SHSU faculty members. All are scheduled for Room 320 in the Lowman Student Center. At 9:30 a.m. Tom Cox of the history department will present "Regulating Rights: Federal Commerce Powers in American History." At 11 a.m. William Carroll of the political science department will present "Comparing Constitutions: Preambles as Statements of Regime Purpose and National Identity." At 12:30 p.m. Jeff Littlejohn of the history department will present "Religious Liberty: From the Constitution to the Culture Wars." At 2 p.m. Michael Vaughn of the College of Criminal Justice will present "Something to Celebrate: Fourth Amendment Liberties." A free copy of the Oxford University Press "The United States Constitution: What It Says, What It Means: A Hip Pocket Guide" will be given to each person attending, while supplies last. For more information contact Frank Fair, professor of philosophy, who coordinates the program on behalf of the American Democracy Project. Constitution Day was established in 2004 with the passage of an amendment by Senator Robert Byrd to the Omnibus spending bill of 2004. Before this law was enacted, the holiday was known as "Citizenship Day." 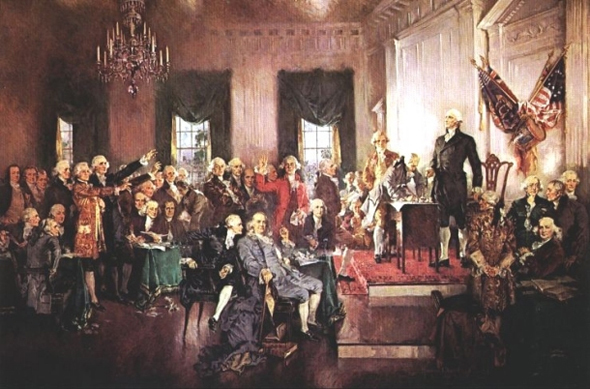 In addition to renaming the holiday "Constitution Day and Citizenship Day," the act mandates that all publicly- funded educational institutions provide educational programming on the history of the American Constitution on that day. In May 2005, the United States Department of Education announced the enactment of this law and that it would apply to any school receiving federal funds of any kind. This holiday is not observed by granting time off work for federal employees.